With the rebirth of County Asylums and the continual work on one of our own personal websites, we have found ourselves reediting a lot of old photographs and revisiting long forgotten places. When our interest in Asylums started back in 2007 (for one of the contributors, at least) we were attending University in Guildford and it was ideally placed at a mid-point between Cane Hill Asylum and West Park Asylum. We also had St Ebba’s, Hellingly and Park Prewitt to also feast on and we were somewhat spoilt for choice for a few years. Oddly though, we drove all the way out to Severalls to get our first taste of an Asylum. At the time, West Park had been shrouded in mystery as it was encircled by the infamous laser/cctv grid and there was little information online other than a few ancient photographs. As ever, things changed. Over a two year period from 2008 until 2011, West Park swung from being a very difficult nut to crack (Graylingwell probably takes the trophy as being the hardest), to a wide open walk in the park explore that saw the just about everyone swarm through. Towards the end of 2007 the high tech security system was disabled by an enterprising night shift guard who preferred to spend his time asleep, than investigate the bells (if only we had known). This marked the beginning of the demise of the buildings. Eventually the system was ripped out and moved on by English Partnerships and the good ol’ hammer and nail was employed in its place. The pendulum of access continued to swing right up until its eventual demolition. 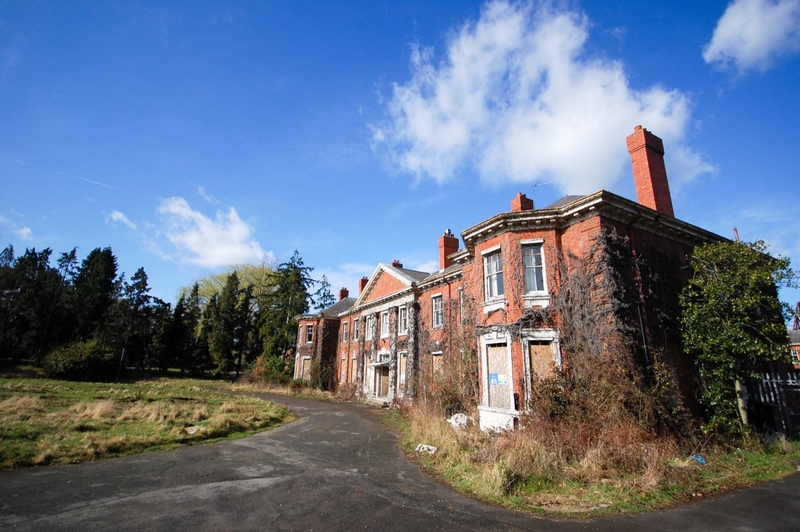 In our opinion, West Park was second only to Cane Hill in terms of Exploring and Asylums (we unfortunately missed out on the Northern ones and ones that had been demolished prior to 2007). It had a vast array of dereliction, items left behind, store cupboards filled with patients belongings and the infamous padded cell. All the while wrapped up neatly in not knowing what to expect with security and if it was going to be a successful trip. Every trip we took, we ended up seeing something different. Some trips were all day affairs, others were short wanders on a summers evening when loafing about was the order of the day, and a few were spent trapped in a single ward. Our first foray into the buildings saw us climbing through a window and into the corridor leading from the Nurses accommodation, Nightingale House, that would have given us straight access to most of the central services and derelict female wards (at the time, a few male wards were still used as laboratories by the local health authority). We didn’t get that far. Within thirty seconds an angry security guard was shouting us down and demanding we stay where we were. It still amazes me to this day how quickly four full grown adults can climb out of a standard sized window. Against all expectations he cornered us, and then to our surprise, offered to show us around if we promised to bugger off and not come back. We obliged not knowing the next time it would be open as he was busily hammering nails into every available surface. The guard happily showed us the padded cell and then kicked us out the front door. To make it even more odd, he offered a full days access to the entire hospital a week later, stating “i’ll bring the keys, a pry bar and really open the old gal up”. We didn’t pass him up and returned to be shown just about everything we wanted. It turns out though, the guard was on the take. So much for an expensive security system and the effort to preserve the buildings. In subsequent visits, we either waltzed in through the open doors and windows of the corridors on the female side, or found ourselves ducking into the service tunnels underneath the Lakeview Villa and navigating our way into the complex by feel, asbestos clouds and low hanging service pipes that leave a good scar. All this left me with a lasting impression that West Park was a bit of a incomprehensible warren. It was quite easy to get disorientated as navigating the befuddling mess of service tunnels forced you to surface every few minutes like a lost gopher in a vain attempt to see where you were. We held out hoping that we could make it past one of the numerous sealed doors. In all of our visits we only ever saw the boiler house once, and that was after getting lost in the tunnels and unexpectedly stumbling onto it. This method of exploring has left us with a very disorganised set of around a thousand photographs spanning a two year period of trying to find our way. Now where to start with them? It isn’t known how long the services were in use for, but they were in a relatively good condition and had all manner of rooms to rummage through. Access was always varied here and the stores area and bakers house both sat at the end of a long and well sealed corridor, that meant we only saw them briefly when they opened up towards the end of 2009. In the same areas, there was a wonderful poster showing the phased openings of the M25 in 1980’s (no photo, unfortunately). The services area also provided one of the few limited routes between the female / male sides, and consequently an area you were most likely to fall foul of security and unceremoniously shown the door. Main Hall (typically burnt down a few years before I visited). At the time, this was piled high with redundant hospital furniture, but with less in-situ laundry equipment as found at Cane Hill. There was a gold mosaic plaque when we first visited, which in subsequent visits had sprouted legs and moved on (thankfully saved)! The female and male laundry would have been delivered at different parts of the wash house to ensure the the two populations were always segregated. This meant that the Laundry area was a warren of side rooms, laundry bins, wash machines, hatches, trolleys. You name it, it was probably in there. It also made for a good place to hide out, take a seat and eat jam sandwiches. Drying Room (knocked into one complete area at some point in the hospitals history). Central Stores; these only opened up a for a few weeks and we were lucky enough to sneak a peak. Bakery / random store of yet more junk – I doubt there are many ovens left like that in existence. We plan to try and post examples from every single ward at West Park Hospital. Our photos are a jumbled up mess due to the ever changing nature of the buildings accessibility, and the inability to photograph everything when trying to figure out where the hell we were, and where we needed to go. There are a handful of areas we didn’t make it into for one reason or another, such as the Chapel on the Male Side and the wards used as Labs. We avoided the ground floor wards as dry rot caused by cavity wall insulation installed in the 1970s, and the removal of the roofing by land pirates, meant that you were in for a quick lesson in gravity and the merits of a free National Health Service. The female side was the more commonly visited side of the hospital as it was the side you typically entered into the main site from (park in dogging car park, cross road, walk through field, climb chainlink fence, head into corridor or service tunnels by the outer villas). We think we are right in saying (there is a plan somewhere showing the closure process), that the Female Side was the first side to fully close, with the part of the Male side being used as Labs for the Surrey area right up until demolition and conversion. 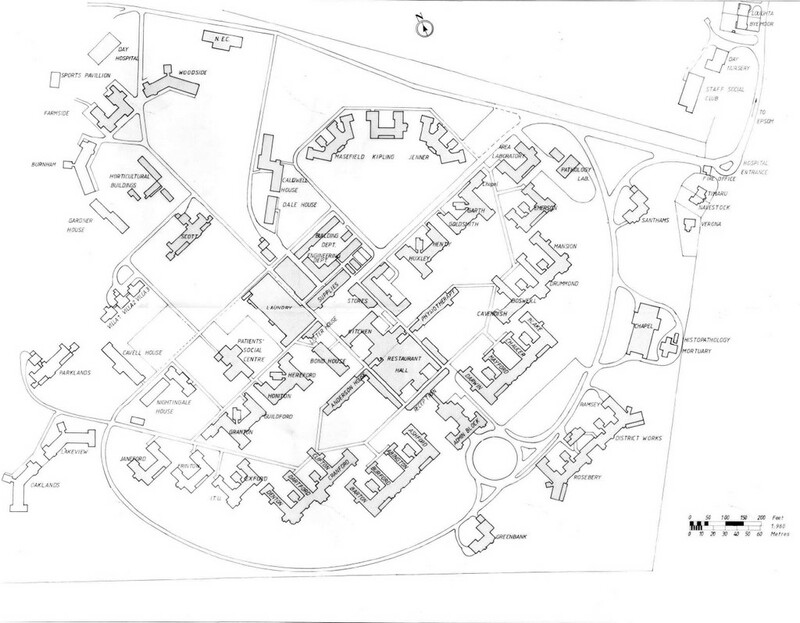 This was the set of female wards located right at the front of the complex, and as such, next door to security. As a result, and in the pursuit of common sense (it does happen), we avoided them for the most part and subsequently have little identifiable photos from here. They were also stripped bare and had been modernised at some point in the past; there were more interesting wards to look in. We once had to employ some lateral thinking in order to make our exit after MC Hammer had nailed shut the way we came in through. We would happily stake £5 on this being the most visited ward in the entire hospital as it had the Padded Cell (door missing since the music video shot in 2008). This was also a ward that had a great deal of peeling paint decorating the walls, a boot store under the stairs stuffed with the belongings of patients that must have been there since the eighties. And finally, as dictated by the laws of the exploring, a Christmas Tree. The first ward we visited after our run in with the security guard back in 2008. He had told us to meet him at the front gate in an hour, so what did we do? Poke about the place until we found a way in on our own. Over the years, this ward seemed to be one of the ones that opened and closed with the wind and whilst the rest of the site was on lock down it could be trusted upon for entry; there were possibly two or three trips were this was the only building we made it into. This was also the ward the people mistakenly identified as for Children, it wasn’t. It was a Creche for staff. At some point in its history, this ward was converted from being used as a ward, to a Occupational Therapy workshop. It was one of the wards with Murals on the upper floor (there was a similar one on the male side), a store cupboard hiding a hand loom and ground floors that were more closely related to a trampoline than supporting the weight of a human being. We spent numerous times in here trying figure out how to get out of here – one confused trip saw us surface here from the tunnels, only to surface here again a few minutes later -, quite an interesting little ward in hind sight. When we first started writing this post, we didn’t remember much of this ward other than it was adjacent to an old entry point and made a ‘safe place’ to prepare our camera gear, and that there was a random store room bolted onto the side leading from the corridor with no real explanation was to why it was there. Looking at some old plans it turns out this was the bath house that would have been used to scrub down new patients before they were admitted to the hospital wards (learn something new every day)! 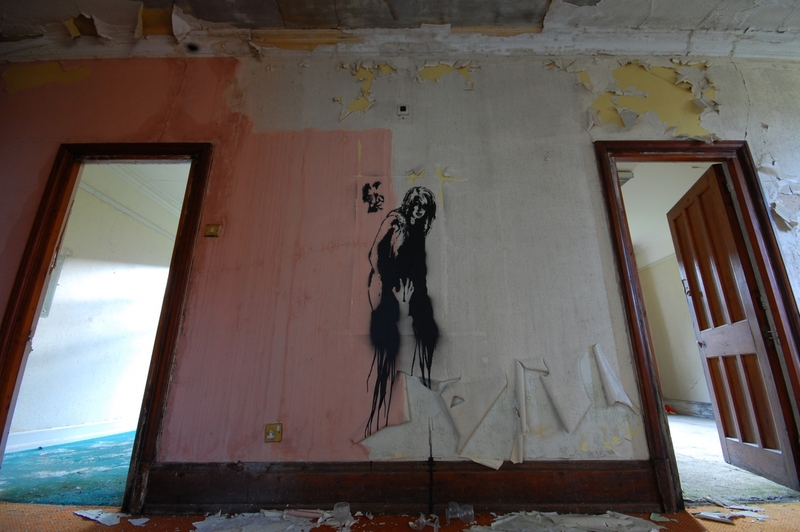 This ward was quite smoke damaged, littered with old bed frames and used for a music video towards the end of 2008. It was also where we held out whilst we tried to figure out of the PoPo were in attendance, or not. Thankfully, there were training dogs and nothing else. We generally ignored this ward as the outer appearance made it look uninspiring, it was only on one of our final visits did we venture in and discover a ward perfectly laid out towards the back of the ground floor. The upper floor was was gutted by fire at some point in the past. Downstairs was inaccessible as water ingress had caused the floors to rot through and kill the access from both corridor doors, but you could work you way through the top ward and down a second set of stairs to the ward below; complete with curtains and beds. We always skipped this one at first as we wanted to get deeper into the site and we were led to believe it was fairly mundane, this was until we found myself hiding here for a short while after a noise prompted us to leg it and seek refuge somewhere. Luckily, it was another group of explorers and it allowed us to explore a previously unexplored, to us, ward. Turned out, like the rest of the hospital, to be a good rummage. The male side of the hospital was a little trickier to explore; access was generally through the main courtyard where the security hut was situated, two wards could only be accessed by crossing large expanses of open ground. There were also two wards were still in use and the staff kept an eye out for trespassers and, to top it all off, the ever changing access of West Park. All this meant that our exploring of the male side was a little more sporadic than that of the female side as the stakes were higher. The rewards were worth it though. Being the second closest ward to securities location by the front gate, so we never spent a great deal of time in here and we have relatively few photographs. It was famed for a grand piano that was brutally overturned and ruined during the open season, and in later years. Bizarrely, it also acted as a Gym for the security guards who had bravely loaded up several hundred kilos of equipment on a floor that could only just support a human – that was a random find on a dark night on 2009! Another ward where our memory is a little blurred after ten years, this is the one with the luminous orange corridor, a ton of peeling paint, weird murals in one section and photographs of Brains and a pile of 8-track tapes from the old hospital radio! It struck me as someone that had been cleared out on a Friday afternoon after a lunchtime trip down the local. This ward was in use during the exploring period and I never got to see round. It was used partly as a store for old hospital equipment, so I can only imagine the goodies hiding behind the locked doors! Another one we only breezed through and didn’t look to hard in, looking back at the photos, we should have done! Had quite a bit of furniture and items remaining. Being on the edge of the main complex and not easily accessed, the villas were consequently overlooked on most of our visits. We did manage to get into some, but not all. Others were death traps, such as Lake View, where a brown pant moment was experienced. Something you never get used too and never forget as an explorer. On one summers evening, we did gain access into Jenner and Kipling, but we have precious little photos from here for some inexplicable reason – it may have had something to do with the beer in hand and the relaxing exploring we were experiencing. Oh well, have a plan instead. One of the old entrances into the tunnels – where a well concealed stairwell lead down to an entrance to the service tunnels that came in handy when the main site was seemingly in lock down, or when a stealthy entrance was required. We only ventured into the Villa on one occasion and took no photos. Random dentist chair in a place where it shouldn’t have been! That window in the background. You used to have to climb out of it to bypass a nailed door in the corridor leading to the female side – turns out on a wet day the drain pipe is slippery as ice and a good way of making an immediately identifiable crashing sound. The basements of this building were piled with interesting equipment. And you can’t have an Asylum post without a corridor shot! Originally posted on TheTimeChamber and edited for County Asylums.